Advantech, the leading embedded platform and total solutions provider, today launched its latest 2.5” Pico-ITX SBC MIO-2360 designed with Intel® Pentium® N4200 and Intel® Celeron® N3350 processor. It provides high CPU and graphic performance (50% better than previous gen.) but its TDP rating is still under 6W that will satisfy fanless thermal designs. MIO-2360 provides various expansion interface within its limited dimensions including miniPCIe, mSATA, and Advantech’s MI/O extension, which offers diversity and flexibility for application integration. MIO-2360 presents a flexible and modularized-design solution through its plentiful and reliable connection choices. Its consistent rear I/O is fully compatible with the full range of 2.5” Pico-ITX product series, which offers customers an easy way to upgrade their current platform design and product applications. When MIO-2360 integrates with Advantech's innovative MI/O extension modules (MIOe-110/MIOe-120), additional I/O functions could be extended from the board level for more USB 2.0 and RS232/242/485 support. Furthermore, MIO-2360 has a low TDP rating of 6 watts that improves heat dissipation and enhances CPU performance. MIO-2360 supports multiple displays (24-bit LVDS+VGA/HDMI+MIOe) and 2K/4K resolution (4K UHD HEVC 10-bit) because of its Intel® Celeron® N4200. Compared with the Intel® Celeron® J1900 processor, Intel® Celeron® N4200 has 2.5x times better CPU performance and offers over 2x better power saving. The 9th Gen. Intel® Graphics Architecture (resolution: 1920 x 1200) offers full HD video playback, the latest media hardware acceleration, and H.265 hardware video transcoding which means smaller size video streaming for those semi-outdoor signage solutions. 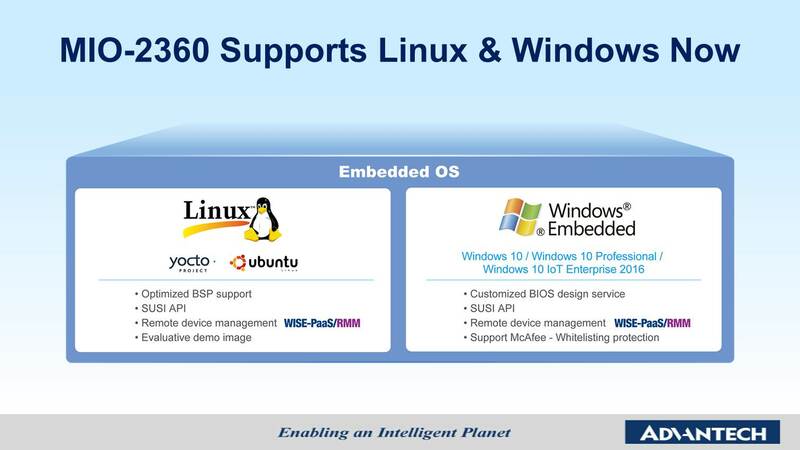 MIO-2360 offers customers various types of selected embedded OS including Windows Embedded and Linux (i.e. Yocto development). 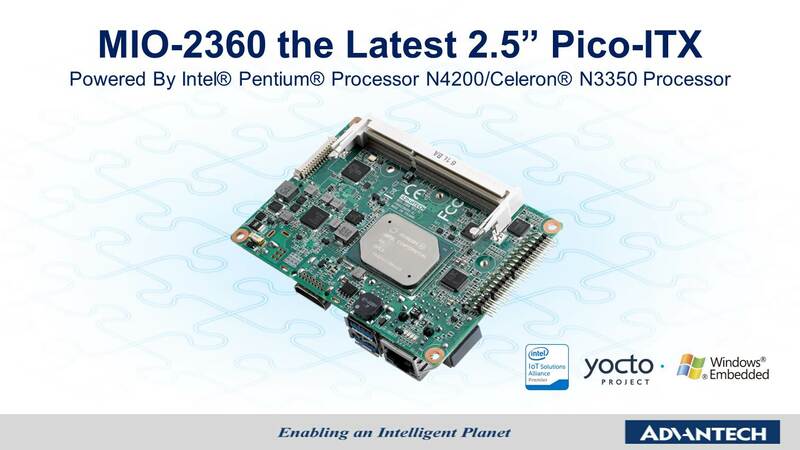 Also, Advantech’s embedded SBC department has invested in developing its first Yocto project for MIO-2360; this includes a Yocto BSP, image, and instructions based on Intel® Pentium® N4200 and Intel® Celeron® N3350 processors. The Yocto project is a suitable replacement for Window CE if product manufactures would like to enhance their embedded development with extra functionality options and open source features for further use. The BSP also integrates with Advantech’s exclusive WISE-PaaS/RMM remote management software which provides real-time synchronized hardware and software monitoring and maintenance for complete protection.